Two years ago this month I reviewed a 3-song sampler from HEAVENandHELL (read the review here) and described their music as "bar rock", that universal sound that can be found in local live venues across the country. I now have in my hands HnH2004, the first full-length album from the band, containing re-recorded versions of all three songs from the sampler. The band has gone through an almost complete lineup-up change between the release of the two recordings, and now features Chris Huggins behind the drum kit and John Mills working the four-string. The charismatic Mia Kileen remains behind the mic, and the riffs are still mastered by Gregg Jones. Despite the line-up changes and the new recordings, the band continues to exude that "bar rock" sound I spoke of - which is not at all a bad thing. Though just about all of the tracks on HnH2004 share a common sound, there are a few that stand above the rest. "Hate", which was a highlight of the sampler, opens with Mia providing a vocal harmonic to a building riff from Gregg and John. This is a change from the sampler version, and a very good one. John's bass dances effortlessly underneath Gregg's forceful riffs, showcasing his technical ability. The song is fairly slow paced, containing several breaks in the action and even an acoustic piece just before it ends, but is one of the more soulful tunes on the disc. Going back to "Suffocating", the lead-off track, the album starts with a bit of a jump as this is one of the most up-tempo tracks to be found in the collection. Gregg lays down a bit of a spacey riff while Chris proves his mettle behind the kit with some considerably complex beats. Mia, who has a strong voice similar to Pat Benatar and Patti Smyth, steps up to the plate as far as emotional delivery goes and gives a top-notch performance. Wrapping up the album is an untitled acoustic ballad with Mia giving perhaps her most heartfelt performance of the album. 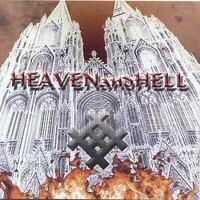 HnH2004 is a consistent statement of HEAVENandHELL's sound, though at times it is a little too consistent - such as the opening riffs of "Suffocating" and "Without You". While not exactly the same, they are nevertheless close enough to be noticed. The band has subscribed to the local indie rock sound which is never unpopular, and will find much appeal among fans of classic, bluesy rock.